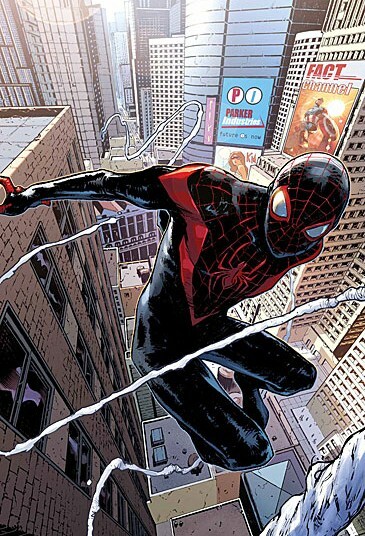 Following the conclusion of multiverse decimating event, Secret Wars the Ultimate universe Spider-Man, Miles Morales is now a denizen of the main, reborn, Marvel universe. Spider-Man #1 reunites the Ultimate Spider-Man creative team (and co-creators of Miles Morales) of writer Brian Michael Bendis and artist Sara Pichelli in an enjoyable and fun premiere issue for New York’s newly established webbed wonder. With Peter Parker’s attentions mostly diverted to the international scene, juggling the concerns of fledgling corporation Parker Industries against global super-heroics and the Spider-Man of 2099, Miguel O’Hara, pursuing a means to return to his own time the protection of the Big Apple’s residents falls on the shoulders of the teenage Miles. Along with his Avengers credentials, this gives Miles a legitimate purpose in the relaunched Marvel universe already crowded with many a Spider-hero. Invincible Iron Man writer Brian Michael Bendis provides a script infused with his trademark witty dialogue and helps to establish Miles’ status quo in a manner that’s accessible to readers unfamiliar with his exploits in Ultimate Spider-Man and sets the scene for established fans of the character. Whilst the struggles of balancing teenage life (whether it be relationships with family, friends or girls) against the call of being a superhero may feel familiar to fans of classic Spider-Man it serves to both reintroduce those ideas into the modern era and to give this particular Spider-Man title its own identity. Bendis does, however manage to add fresh components to the main elements of the original Stan Lee/Steve Ditko era – in particular, having both of Miles’ parents alive and his friendly neighbourhood alter ego known only by his father and best friend Ganke allows for some interesting character dynamics. Whilst the exasperation of Miles’ father carries some dramatic – yet light-hearted – weight, Bendis brings that wit fully to bear in fun exchanges with Ganke and his high school teacher as he makes seemingly futile efforts to escape class in the name of great power and great responsibility. That Miles rises to the cause with little complaint is a credit to Bendis and only adds to the character’s likeability and the potential for him to become a key player in the new Marvel U. The world of Spider-Man wouldn’t be complete without a huge threat to counter and Bendis and Pichelli pull no punches with this issue’s opening pages as Miles faces the demonic villain Blackheart, with the apparent destruction of New York and the fall of the Avengers ensuring the stakes are well and truly high. Sara Pichelli’s pencils are as detailed and energetic as ever, although not quite as sharp as her previous work on the Ultimate Comics titles and crossover mini-series Spider-Men, she brings the pages of Spider-Man to life, the range of expressive character facials aiding the humour nicely and expansive city scapes placing the action on an epic scale. Together with the paint-like colours of Justin Posnor, Pichelli gives the title its own visual identity that evokes the fun and excitement of Bendis’ script and the overall spirit of a good Spider-Man comic. The bottom line: Marvel adds another Spider-hero to the post-Secret Wars world and Brian Michael Bendis and Sara Pichelli provide an action packed and fun first issue for the likeable Miles Morales in this promising new series. Spider-Man #1 is published by Marvel Comics and is available in print and digital formats now. Cover artwork for Marvel Comics’ ‘Spider-Man’ #1 by Sara Pichelli.